What are Stem Cells and how can stem cells benefit me? Stem cells are undifferentiated cells with the ability to regenerate and convert into differentiated cells, producing various types of tissues.Adult mesenchymal stem cells (MSCs) can be found in a person’s blood, bone marrow, or adipose tissue (fat). Adipose fat tissue is an abundant source of stem cells. The best quality adipose cells are derived from the use of collagenase to breakdown the extracted fat. Autologous stem cells from a person’s own fat are easy to harvest safely under local anesthesia and on average produce quantities up to 2,500 times those seen in bone marrow. Bone marrow stem cell extractions are quite painful and carry a higher risk of infection. The higher the number of stem cells, the greater the probability of patient success. Once these adipose derived stem cells are given back into the patient through IV infusion or joint injection, they have the potential to repair damaged human tissue by influencing healing. Examples of these cells are bone, cartilage, nerves, fat, muscle, vessel walls, ligaments, and organ tissue. Stem cells’ ability to form bone and cartilage makes them potentially highly effective in the treatment of degenerative orthopedic conditions. Their ability to form new blood vessels and other tissues makes them suitable for modifying a large number of traumatic and degenerative conditions. In a recent study research showed that Stem Cells from adipose tissue, injected with platelet-rich plasma (PRP), could regenerate cartilage-like tissue in human osteoarthritis (OA) patients.1 Multiple case studies show significant improvement in patient pain and mobility levels after stem cell administration in the joints. Mesenchymal stem cells have resulted in pain and functional improvement in a number of preclinical and clinical trials. Importantly, recent limited case series evidence has shown regrowth of cartilage volume and disease modification following stem cell injections.2 A case series of 339 patients, reporting that of those patients requiring total knee replacement (69 %) only 6.9 % still required replacement surgery after stem cell therapy. Sixty percent of patients reported greater than 50% pain relief and 40% reported >75 % pain relief at 11 months.3 Base on this clinical data, we believe in offering stem cell therapy to minimize the need for surgical intervention in Osteoarthritic patients. We believe that in a traumatic event such as a stroke, the patient should have the option of obtaining their cells from our FDA registered stem cell bank to be used within 24 hours of the injury. Based on the studies referenced, it appears using your stem cells can significantly impact recovery and possibly save thousands in hospital, rehabilitation, and unemployment costs. Our network has anecdotal and experimental evidence that stem cell therapy can be effective in healing and regeneration. Stem cells look for damaged tissues, which naturally heal the body. In an effort to provide symptom relief for patients suffering from certain degenerative diseases that are not improving from common modalities of treatment, our network has launched investigational studies of treatment effectiveness with adipose stem cell harvesting. This technological breakthrough allows patients to safely receive millions of their own autologous stem cells. If parents are banking their children’s umbilical cord stem cells for the future, we believe that adults should also have access and take advantage of banking their own stem cells. All of our sterile procedures are non-invasive and done under local anesthesia. 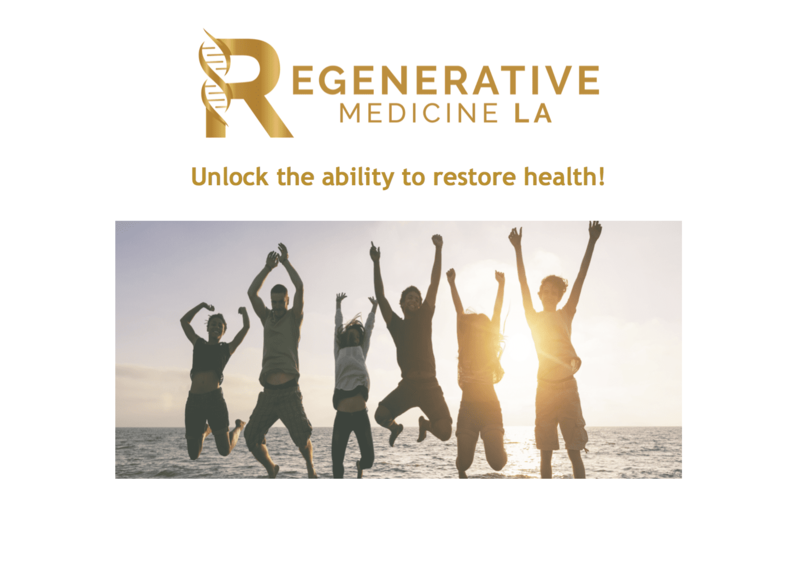 Regenerative Medicine LA in collaboration with The Cell Surgical Network is proud to be a world-class facility offering Stem Cell treatment for patients looking for cutting edge therapies to improve their lives. 1. J, Pak. Regeneration of Cartilage in Human Knee Osteoarthritis with Autologous Adipose Tissue-Derived Stem Cells and Autologous Extracellular Matrix. Biores Open Access. 2016; 5(1): 192–200. 2. J, Freitag. Mesenchymal stem cell therapy in the treatment of osteoarthritis: reparative pathways, safety and efficacy – a review. BMC Musculoskelet Disord. 2016; 17: 230. 3. Centeno CJ, Schultz JR, Cheever M, Robinson B, Freeman M, Marasco W. Safety and complications reporting on the re-implantation of culture-expanded mesenchymal stem cells using autologous platelet lysate technique. Curr Stem Cell Res Ther. 2010 Mar; 5(1):81-93.
bone marrow stromal cells after cerebral ischemia in rats. Stroke 2001;32(4):1005-11.
administered 1 month after stroke. J Cereb Blood Flow Metab 2007;27(1):6-13. 6. Mahmood. A Long-Lasting Benefits after Treatment of Traumatic Brain Injury (TBI) in Rats with Combination Therapy of Marrow Stromal Cells (MSCs) and Simvastatin. Journal of Neurotrauma. 2008 Dec; 25(12): 1441–1447. 7. Isakson, M. Mesenchymal Stem Cells and Cutaneous Wound Healing: Current Evidence and Future Potential. 8. S, Geeta. Transplantation of Human Embryonic Stem Cells in Patients with Multiple Sclerosis and Lyme Disease. The American Journal Of Case Reports. 2016; 17; 944-949.